American Express (s axp) is partnering with Twitter and letting its members link a merchant coupon to their card by tweeting out a hashtag from a retailer. The service is similar to one that American Express has with Facebook, letting consumers use their favorite social network to take advantage of special offers. The way it works is that consumers who sync their credit card to their Twitter account will be able to tie offers from merchants to their card by including a specific hashtag in a tweet. When they go to redeem their offer with a purchase using their synced card, the discount will be applied to their card and reflected in their account within a few days, according to American Express. Users don’t have to actually clip a coupon or print anything out to take advantage of the service. They just have to send a tweet and the discount is stored for them. American Express has created a new Twitter handle (@amexsync) that will confirm an enrollment in an offer or will notify users if an offer has expired. 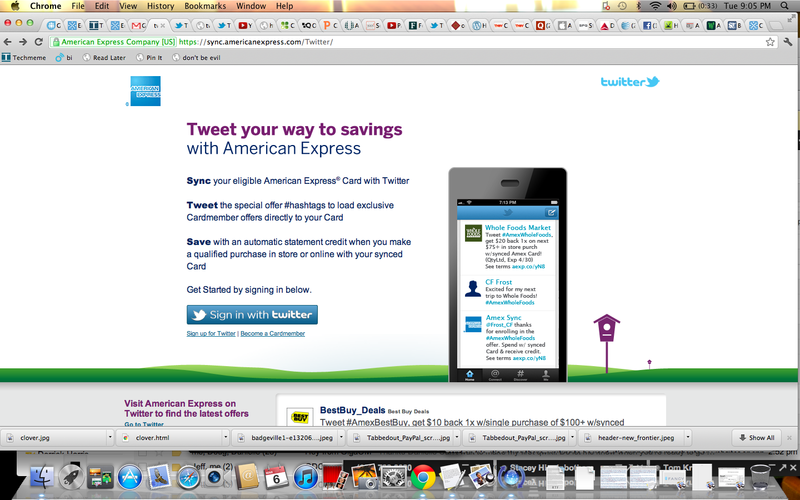 It will also direct people to the official @americanexpress Twitter account to see new favorited offers. There’s a whole host of merchants who will be participating in the program including Best Buy (s bby), H&M, McDonald’s (s mcd), Whole Foods (s wfm), TicktetMaster and others. Linking a Twitter coupon to a card can present some complications over other digital coupons. Even though a person might have linked a coupon to their card, their only confirmation is an @reply message from American Express. If that tweet gets hard to find in a user’s interactions list or they don’t remember to favorite that tweet, they might not remember the exact terms of the offer. That might be a problem if it’s not easy for people to know that they can take advantage of a deal when they go to make a purchase with their card. But I think linking offers to credit cards is gaining steam and shows that even with the push toward mobile payments, there’s simple ways to attach coupons to the credit cards people are already using. And it shows that Twitter can be leveraged for more social commerce. This is an excellent example of a good business model for Amex. They are doing this on foursquare as well and there they link checkins to discounts. This motivates users to announce that they are at the location which then reinforces buzz. yeah, this is a smart move by Amex. the Foursquare and Facebook integration was good but tweeting may be easier for users and more viral for merchants.